Update On Netscape.com: It's Done, Possibly Moving To WOW.com. Big AOL Layoffs Coming. We’ve gotten an update on the controversial post we wrote earlier this month on the possible shutdown of the fourteen-month-old old Digg-clone Netscape. Too many AOL execs have had their eye on the Netscape .com domain name, which brings in 3 million or so page views per day. 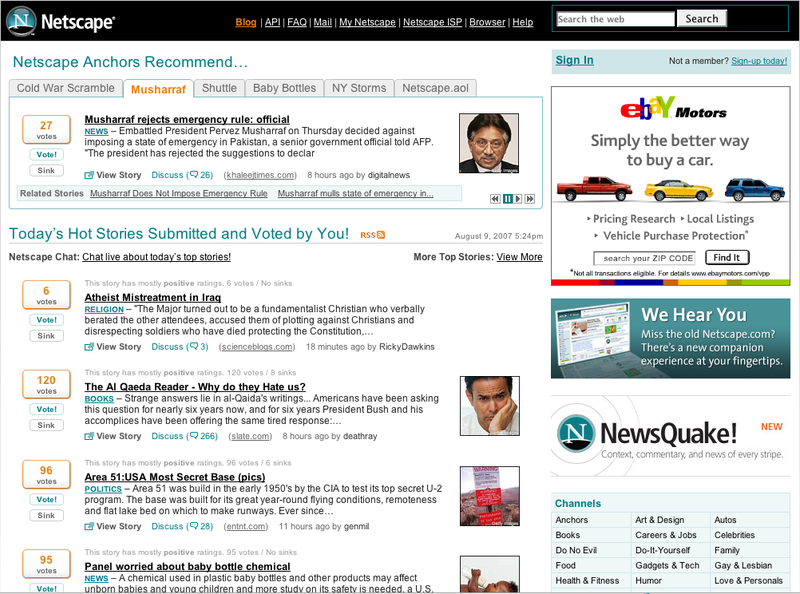 The most likely scenario – The current home page at aol.netscape.com becomes the default page for Netscape.com, and the year old digg-clone moves to a new domain. We hear that wow.com, a domain previously owned by Compuserve and acquired by AOL, is a potential landing place for the Netscape service. AOL may have different plans for wow.com, however, and the Netscape portal may land somewhere else. Either way, look for a link or module from the old service to remain on the netscape.com domain after the changeover. We also expect to hear about material layoffs at AOL in the next six weeks, possibly as much as 15% of the 16,000 strong workforce. Next week the senior execs are supposed to be notified of the exact size of the cuts and whether they are targeted to specific business groups or across the board cuts.